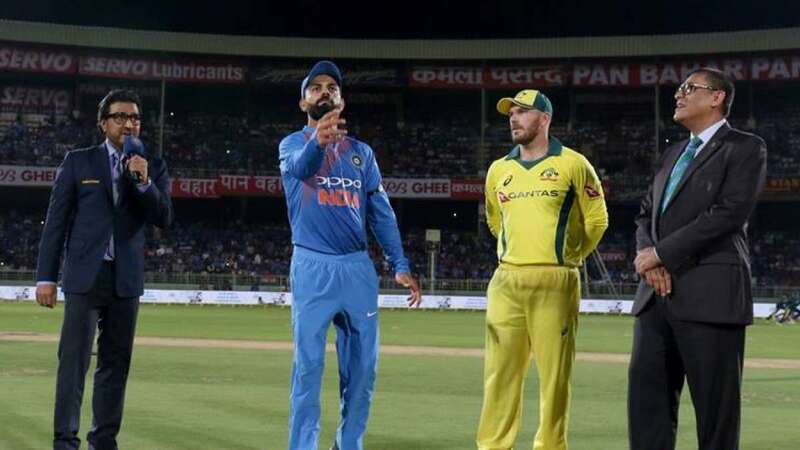 Visakhapatnam : Australia won the toss and elected to field against India in the first Twenty20 International match at the Y.S. Rajasekhara Reddy ACA-VDCA Cricket Stadium here on Sunday. For India, K.L. Rahul came back into the playing XI while Shikhar Dhawan has been rested. Pacer Umesh Yadav replaced Bhuvneshwar Kumar and Vijay Shankar made way for debutant Mayank Markande. Australia 9/2 in after 3 overs, chasing 126. Australian bowlers restrict #TeamIndia to a total of 126/7 in 20 overs. Top class : @imVkohli hits straight over bowler's head. TeamIndia and Australia pay homage to the martyrs of Pulawama Terror Attack before the start of play today at Vizag. #TeamIndia and Australia pay homage to the martyrs of Pulawama Terror Attack before the start of play today at Vizag. India: Rohit Sharma, Lokesh Rahul, Virat Kohli (captain), Rishabh Pant, MS Dhoni (w), Dinesh Karthik, Krunal Pandya, Umesh Yadav, Mayank Markande, Yuzvendra Chahal, Jasprit Bumrah. Australia: Aaron Finch (captain), D Arcy Short, Marcus Stoinis, Glenn Maxwell, Peter Handscomb (w), Ashton Turner, Nathan Coulter-Nile, Pat Cummins, Jhye Richardson, Jason Behrendorff, Adam Zampa.